Only 3 days until Halloween! I can hear the buzz around the school yard, everyone is getting so excited! I had planned on making a few more cocktails before Halloween this year, but to no surprise, I got sick a week ago and an still not feeling 100%. I have too many things going on this weekend to be sick, so it's time to have a shot of this here Poisoned Apple and get on with my weekend! 'Tis the season of black vodka! I love this stuff. I love that it's black, I think that's so cool. I decided to go with a layered shot today and since green is one of the colors of Halloween, what better liqueur to use but sour apple pucker! This time when I rimmed my shot glass I used simple syrup. Although I have a huge "dislike" for sprinkles or anything like them......I DO think they look really cool rimmed on a cocktail glass or shot glass (don' tell my friends or family I said this...I'll never hear the end of it............ever). I saw these black and an orange shiny sprinkle jars at Target not too long ago and decided to get them for upcoming drinks. Layering a cocktail can be tricky at times for sure......but sometimes it's REALLY easy. 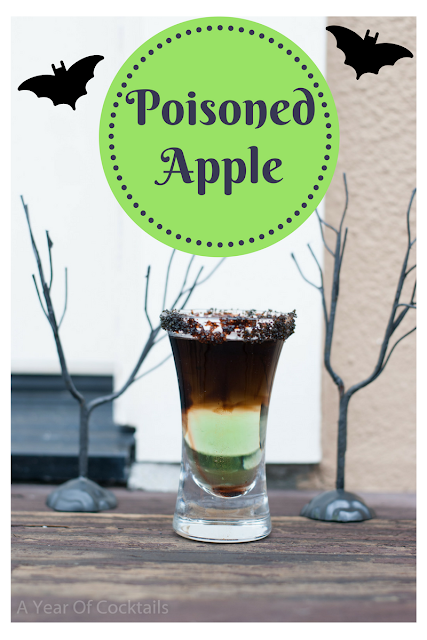 Some alcohol (such as the sour apple pucker) has enough sugar in it to make it more dense. This is allow lighter alcohols to more or less float on top. With something like this shot you can just pour in the sour apple pucker and then slowly towards the side of the glass pour in the black vodka. Sure some might go below the pucker for a moment, but it will rise up and create that layer right after that. This combo of sour apple pucker and vodka is pretty darn good. Layered shots sometimes scare me, especially when the hard alcohol is on the top of the shot. As long as you take it in one big sip (as you're supposed to take shots), you'll be fine! If you notice the black sprinkles started to slide down the shot glass inside and created a brownish streak inside the shot. I think that's kind of cool! It reminds me of my Happy Birthday Tini I made a while back. I loved the effect the all of the different colored sprinkles made on the inside of that glass. Rim the top of a shot glass with simple syrup and then black sprinkles. Pour in the apple pucker first. Next on the back of a spoon, slowly pour the black vodka on top. Here's to one of my kids most favorite holidays being only 4 days away!! You had me at cocktail365! Why haven't I come aross your site before???? I definitely will be back! Thanks for posting this at the traffic jam weekend link party for me to find! I am sooo happy you found me!! I have a LOT of fun cocktails for you to try! Glad you're here!! Cheers! !